Visitors wishing to park at UNE are required to abide by the UNE Parking Policy & Parking Procedures. 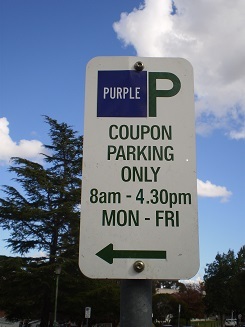 UNE's parking operates under a Restricted Parking Scheme which means that vehicles must park in bays identified by signage. Vehicles that park in areas such as on the grass, on footpaths, or anywhere signage is not erected permitting you to park, may be issued with a Penalty Notice issued. UNE has visitor parking bays located in various areas of the Campus. These Bays are identified by a Purple Permit signs. Tickets issued from our Parking Machines & holders of Scratch & Display Permits are permitted to park in both Purple & Blue permit bays. Visitors are required to pay for parking between the hours of 8.30am & 4.30pm Monday–Friday. There is no requirement to pay for parking outside these hours meaning parking in these bays on weekends & Public Holidays is free of charge. Daily Rate - Minimum purchase is $1.00 (buys 1 hour of parking time) up to $8.00 (buys 8 hours of parking time) Proportional rates in between apply. Parking Ticket Machines on campus accept payment via coin and credit cards. Credit cards accepted are Visa and Mastercard. (Debit cards not accepted) Due to the limited places on campus to obtain change, it is advisable to bring with you enough coins to purchase a coupon or alternatively pay via your Visa or Mastercard. Tickets once purchased must be displayed on the vehicles dashboard so that they can be validated by the Parking Officers from outside the vehicle. Tickets purchased from the Parking Machines are non refundable. Some Visitors may be issued with a Scratch and Display Coupon by an internal department or faculties. These Scratch and Display Coupons are to be displayed the same way as a ticket purchased from a Parking Machine. The purchase of a ticket does not guarantee a space in a particular car park. The purchase of a ticket provides a "license to hunt" on a first in basis. Free parking is available on campus in ¼ hour, ½ hour and 2 hour bays. These timed bays are positioned in various locations around the campus. The Parking of Motor Cycles on Campus is free when parked in designated motorcycle parking areas.